DENMARK: Vestas has revealed a new tower design for low-wind sites using a concept from bridge building to spread increased load. The prototype tower is designed for use at low-wind sites, where hubs are generally elevated. "Higher hub heights increase loads on towers dramatically. These loads can be reduced on the tower with cables. "The hub height would depend on site and wind conditions," Edgar Leijten, lead towers engineer at Vestas told Windpower Monthly. Vestas said specific hub heights for the tower have not been released as a decision to commercialise the design had not yet been made. A prototype recently installed at the national test centre in Osterild will undergo a verification programme, likely to extend in to the autumn, Leijten said. The prototype has a hub height of 137.5-metres, with a V126-3.45MW turbine installed on top. Vestas' new design was inspired from the proven technology of the bridge industry, Leijten explained. The cables are manufactured in a "multi-strand system" as commonly used on bridges, where each cable consists of a bundle of strands made of high-strength steel. This offers a built-in redundancy, according to the manufacturer. 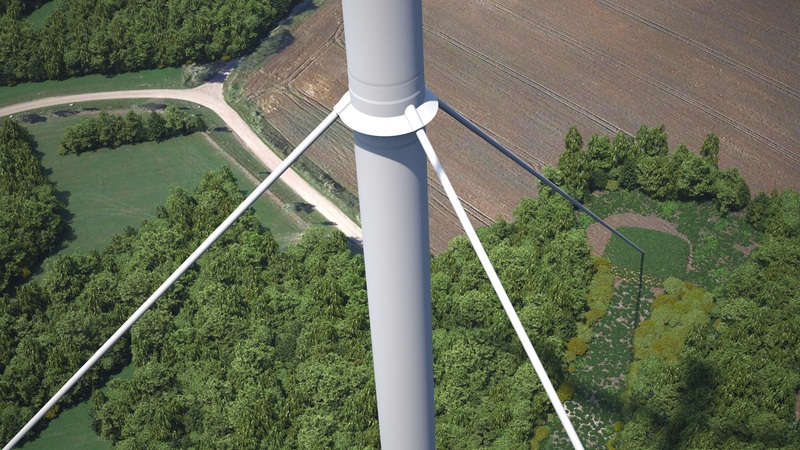 The use of cables to spread the load means Vestas is able to install the turbine on narrower towers below where the cables connect, the manufacturer said, meaning less material would be needed. 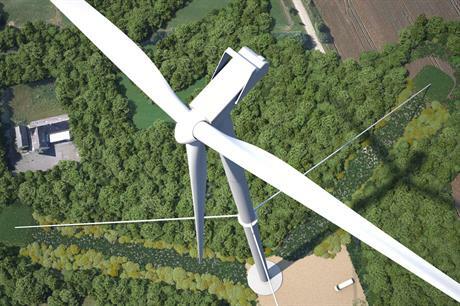 According to Vestas' designs, cables extend from roughly halfway up the tower in three directions to the ground. Leijten said the cables are attached to the earth with "stay" foundations. These are smaller concrete foundations with the same basic construction procedures as the foundation of a conventional tower. The set-up can also lower transport costs. Vestas' large-diameter steel tower (LDST) design has a 6.2-6.5-metre base diameter. This exceeds the 4.2-4.3 metre maximum size for road-transportation that limits regular tubular steel towers. This means the base sections need to be transported in sections, adding to haulage costs. The new tower concept also reduces the material needed in the foundations, although Leijten was unable say by how much. "Because the cables can spread the load, we can use thinner towers below where the cables attach, however it is too early to say how much less material can be used." It is not the first time the industry has experimented with a departure from tubular steel towers. Nordex, Siemens and Enercon have all trialled concrete-steel hybrid towers. 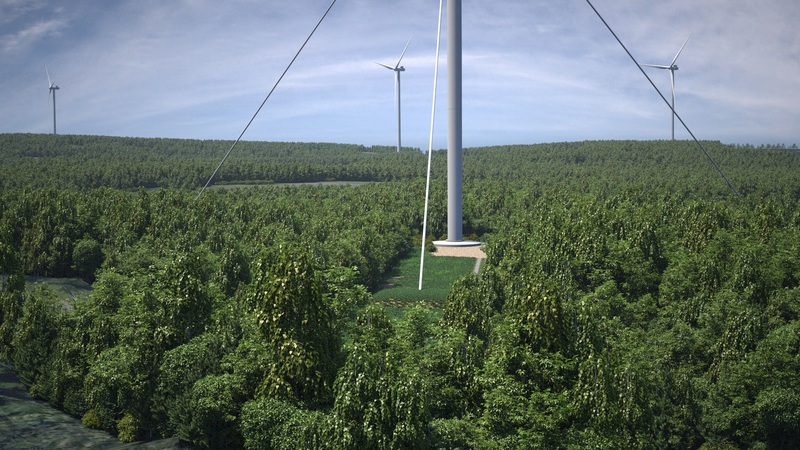 US manufacturer GE offers a "Space Frame" tower with its 2.5MW and 2.75MW turbines for hub heights of 139 metres. And Indian OEM Suzlon is currently trialling a 120-metre tubular and lattice-style hybrid tower for its S111 2.1MW turbine.